If you are planning a Sweet Sixteen/Quinceanera, or any other type of party. Would you like to perform for your guests? Imagine what it would be like to have professional choreography customized for you and your guests. Our Experienced Dance Instructors with 15 years of teaching has had the pleasure of choreographing hundreds of eye catching routines. A list of what we are able to Choreograph are any of the Ballroom or Latin Dances for example: Slow Waltz, Cha-Cha, Tango, Swing, Rumba, Bolero and many more! 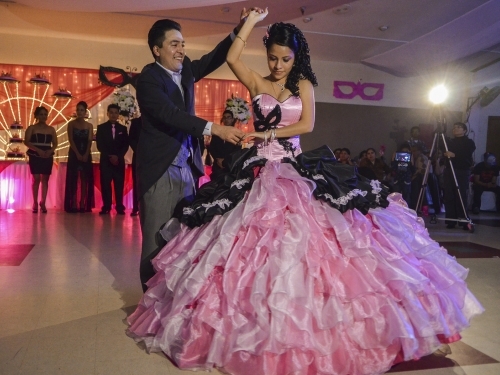 Quinceanera’s, Sweet Sixteen’s and Sweet Twenty one’s have continued to be more popular than ever. We have been working on more and more choreographed parties that dance performances have also been requested. Learn to dance with your Mother or Father & with your friends. We can arrange for a set amount of group dance lessons for the participants and we may not only teach them how to dance, but everything is carefully and skillfully choreographed. The end result is a very memorable day and a fantastic party. Please call us for more information. Our studio is also available for these parties when you call to request. Do you have packages for Quinceaneras? Yes! We will be more then happy to help you out with the Quinceanera choreography.